You've purchased the perfect Purrfect Post® and gotten it home. Now how can you get your cat to use it? 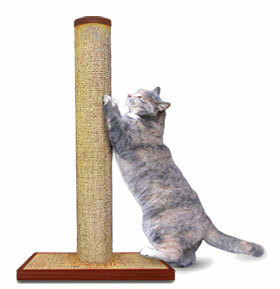 Below are several helpful, easy ways to help your cat love her new scratching post. The initial placement of your Purrfect Post may affect how quickly your cat adapts to its use. At first, place the post in a prominent location in your home or (if your kitty has already started scratching furniture) place it as close to that furniture as possible. Once good scratching habits have been established, you can gradually move the post to a less conspicuous location. Encourage your kitty to use her post with clever enticements. If possible, play with her and feed her near the post. Rub dried catnip leaves or powder into it or use catnip spray; reward her with a favorite treat when she uses it. Make interactions surrounding the post pleasurable. Have her chase a string or a toy around the post, attach toys to it, or place a favorite toy on top of it, which will result in her digging her claws into the post. Eventually she will learn to love it and claim it as her own. Cats like to scratch when they awaken, especially in the morning and the middle of the night, so it's also a good idea to put a post where your kitty sleeps. If space permits, a scratching post in every room of the house would be any cat's dream. If at first your kitty is reluctant to give up her old scratching spots, there are ways to discourage undesirable behavior. Cats like to scratch for several reasons (See: "Why Cats Scratch"), but a major one is to leave their scent. Applying a pet odor remover to the old scratching locations may reduce the appeal for your cat. Covering the area with aluminum foil or double-sided tape can be a great deterrent. These surfaces don't have a texture that feels good to scratch. Also, cats have an aversion to citrus odors. Use lemon-scented sprays or a potpourri of lemon and orange peels to make her former scratching sites less agreeable to her. If your kitty still persists in scratching the furniture, try squirting her with a water gun or a spray bottle set on stream. Another option is a loud whistle or other noisemaker. You must "catch her in the act" for the deterrent to be effective; it will not work if it is a moment too late. Care should also be taken with this or any form of negative reinforcement such as yelling or chasing because it can result in stress for your cat that can lead to more negative behaviors. If you are starting with a kitten, you're in luck! It's even easier to initiate good behavior patterns in kittens than to correct undesirable ones in adult felines. From the beginning, teach your kitten the appropriate place to scratch. Use the methods described above, especially playing near the scratching post to capture her interest. Take advantage of your kitten's desire to play and attach toys to the post. She will soon "dig in" to catch her toy and discover how good it feels to scratch this surface. Do not take her paws and "make" her scratch the post. This is a major turn-off and will only inspire a bratty "you can't make me" attitude. Even at an early age, cats refuse to be coerced into doing what they don't want to do. If she starts to scratch an inappropriate object, immediately place your cat in front of her scratching post and begin petting her. Some cats will begin kneading when petted, thus digging their claws into the desired surface and establishing this as a fine place to scratch. Cats are creatures of habit. Start them off with good ones. You can get more tips in our informative article, "How to Train Your Cat or Kitten to Use a Scratching Post."